It's still 93 degrees and humid here today, but the calendar says that it's September and Labor Day was Monday, so it's time to officially wrap up another great Big Book Summer! I host this challenge every summer and always enjoy participating in it myself. 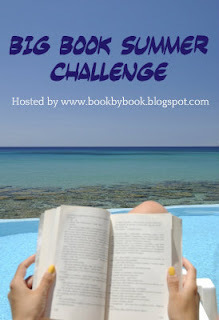 You can read all the details at the Big Book Summer Challenge page, but the bottom line is to read books 400 pages or longer during the summer - just one or a few or as many as you want! What I really love about this challenge is that it gives me the extra incentive I need to finally tackle some of the longer books I've put off reading - I always end up reading some really amazing books, and I make a (small) dent in my overflowing TBR bookcase, too! You can go back to my starting post for My 2018 Big Book Summer in May to see what books I hoped to get to this season. So, I met my goal of finishing 6 Big Books this summer, though I added the audio and didn't have time for The City of Mirrors (#3 in The Passage trilogy) by Justin Cronin (though I still plan to read it and finish the trilogy). Wow, that's a pretty good Big Book Summer for me! You can read my reviews of the Big Books I read at the links above. I enjoyed every one of these, and a few (Afterworlds, Dragonfly in Amber, and The Sparrow) just blew me away. As I say every summer, why did I wait so long to read these amazing books?? So, that was my summer, but lots of other people enjoyed a wonderful Big Book Summer, too. A total of 26 people joined the challenge this year, with 15 linking up on the challenge page and another 11 through the Goodreads group for those who don't have blogs. I enjoyed reading all your reviews of Big Books, and we had some great discussions in the Goodreads group! You can check out links to reviews and wrap-up posts on the challenge page. Jane is a repeat participant from past summers and enjoyed the challenge again this year. Here's to another rewarding, fun Big Book Summer - Congratulations to everyone who participated! I hope that YOU will join the fun next year! This was such fun and GREAT motivation -- and I was pleased to get some excellent "big books" completed this summer. I plan to be back next summer, too. And congratulations to Jane!! Congrats to Jane! I'm excited to see how much you enjoyed Dragonfly in Amber. I absolutely loved Outlander but have been putting off the rest of the series because those books are so dang long!! They scare me off!! I was the same way, Darlene - that's why Dragonfly in Amber sat on my shelf for so many years!! It was even a Big Book Summer book twice before and I still didn't get to it. So glad I finally did - as soon as I started it, I remembered why I loved Outlander so much, and this 2nd one was a very different story but just as compelling. Now I can;t wait to read more! WOW Sue, you had quite the tomes for summer reading. Thanks, Diane - I always have plenty of Big Books sitting on my shelves to choose from. You should join the fun next summer! Five big books is impressive, indeed! I managed 3 and was proud of it. As it turns out, I’m about to start #4 in the Gabaldon series myself, keeping pace with the TV series. Thrilled that I won the prize—I will put it to good use, I assure you! Thanks, Jane - enjoy the Gabaldon - now I want to read more, too! Will try to send your gift cert tomorrow morning before we head off. Enjoy! !